Being a wedding photographer specialized in Hacienda Weddings, I get really excited when discovering new venues of this type, and couples who share my fascination with that aesthetic! 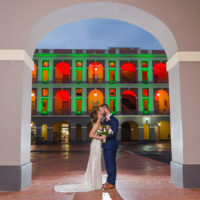 After several months of e-mail communication with Lauren, I knew I was going to like this event: small gathering, just a couple of hours, ceremony overlooking the Puerto Rico rainforest, intimate affair with just the most important friends & family. But, then I arrived at Hacienda Azucena: met the staff, couple, and venue. And I fell in love with it all. It was an amazing, laid-back wedding event, with a hipster/whimsical vibe, a killer music selection, great food… It’s just like I saw my own wedding happen in front of me! Ok… enough swooning. Let’s see the images!